Lot:5021 Friedberg 104 (W-1284). 1880 $10 Legal Tender Note. PCGS Currency Gem New 66 PPQ. Face Proof. Friedberg 104 (W-1284). 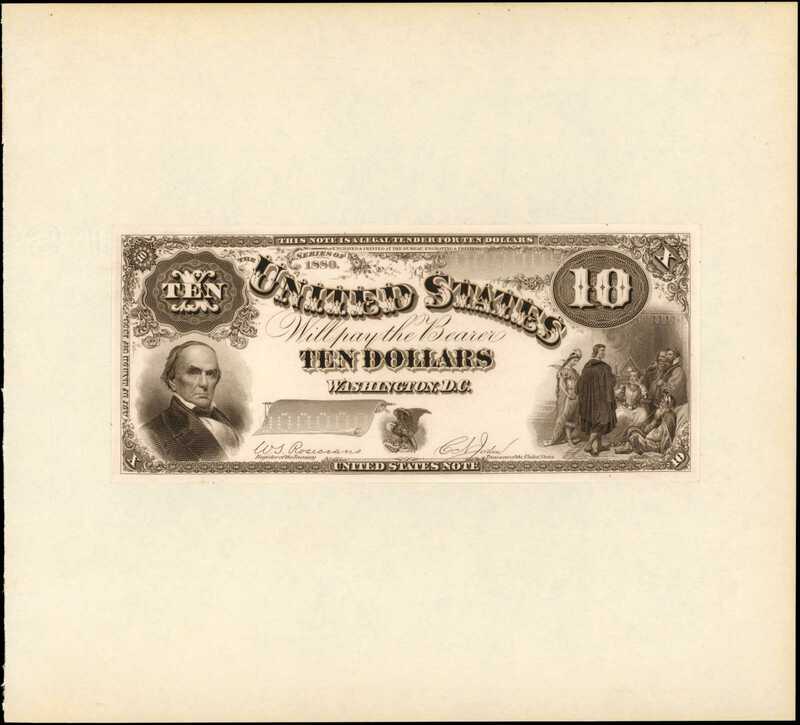 1880 $10 Legal Tender Note. PCGS Currency Gem New 66 PPQ. Face Proof.Hessler-Unlisted. Printed on India paper, mounted on wide margin paper. Imprint of the Bureau, Engraving & Printing. Black and white portions of the face only. Titles and obligations across the center. Lower left, Daniel Webster. Lower right, Pocahontas presented to the Royal court in London. Bottom center, small eagle that inverted creates the so-called "Jackass" feature. Engraved signatures. Zero numbers perforated in both serial number blocks. Similar to Hessler 480, page 41, with slight differences. Deep black on white India paper. Wrinkling at the right side, rather trivial. One of many stellar federal proofs within the Caine Collection that traces its origins to Stacks September 2010 Americana Sale.pFrom Stacks Americana Sale, September 30-October 2, 2010, lot 1070.